The SunTech Vet20 Veterinary Blood Pressure Monitor combines our expertise and experience with market-leading blood pressure solutions, to create an automated blood pressure monitor with an animal-specific algorithm so you can take reliable, accurate measurements on awake or sedated companion animals with no shaving or gel. Replacing the standard Doppler device, the SunTech Vet20 takes just a matter of minutes to obtain results and requires no gel or shaving. Developed in conjunction with experts from leading veterinarian schools, the user-friendly touch screen makes this device simple to use and requires little to no training. In an effort to manage nervous animals, this monitor is extremely quiet, with the option to turn off alarms and audible indicators. 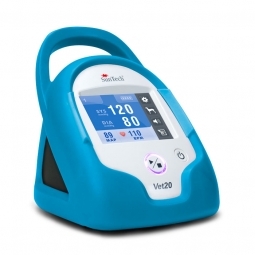 SunTech Medical’s Vet20 is light, portable and battery operated with an automatic battery-saving capability which powers down the device after a specific time of inactivity. It can also be powered by A/C adapter and is small enough to carry between exam rooms, making it convenient for both patients and providers. 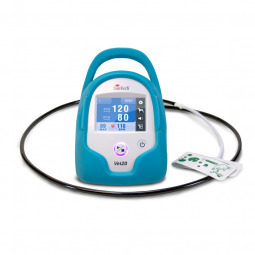 Supported by clinical evidence and testing, the SunTech Vet20 BP monitor provides highly accurate BP measurements on awake companion animals with fewer failed measurements. Reliability: As a result of SunTech’s motion-tolerant technology, the Vet20 has a high success rate for BP readings. Simplicity of Use: Intuitive, touch screen interface has all necessary features for reviewing and analyzing BP data. Accuracy: BP algorithm was specifically developed for companion animals by experts at a leading vet school. Silence: Device quietly measures BP and alarms may be silenced to avoid frightening the animal. Speed: Take multiple measurements in a matter of minutes! Portability: Battery-powered device can be easily moved between exam rooms. Memory: The Vet20’s advanced memory ensures data is always retained when the device is powered off. Averaging: Users can select specific measurements from the device memory and perform automated BP averaging. SunTech’s veterinary products are not human devices re-packaged. We used data from companion animals to develop our SunTech Vet BP technology. In fact, our SunTech Vet BP technology has recently passed the ACVIM blood pressure protocol on anesthetized dogs and here’s a link to the journal article in Veterinary Anaesthesia and Analgesia. To request a quote for the SunTech Vet 20, simply click here. Learn more about the full-line of BP cuffs that are available with Vet 20 BP monitor, by clicking here. Portuguese translation of the SunTech Vet20 Brochure. Spanish translation of the SunTech Vet20 Brochure. Quick Start Guide for the SunTech Vet20. Technical Specifications for the SunTech Vet20. Power Point that walks you through the process of Calibrating the SunTech Vet20. Power: 4 AA alkaline batteries. What power options are available? 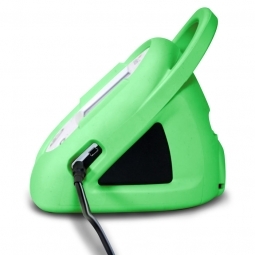 The SunTech Vet20 can be powered by batteries or an AC adapter. How many measurements can I store in Memory? You can store up to 50 measurements. The monitor has a revolving memory. When you take your 51st measurement, it will be listed as measurement #1. How do I delete BP data from memory? Select the Memory button and touch the Delete button. Before the memory is cleared, you will be asked to confirm or cancel the deletion. When you clear the Memory, you delete all measurements. For medium-sized dogs, which animal mode do I choose? Use cuff size as the determination factor. If a #3 cuff or smaller is the best fit, choose small animal mode. If #4 or larger, choose large animal mode. 250+ BP measurements can be expected from typical alkaline batteries. Lithium batteries will provide even more measurements. Battery life is very dependent on the touch screen display ON time. To maximize life, SunTech suggests setting the Auto OFF timer to 1 minute. Can I use this monitor on awake and anesthetized animals? Yes. The SunTech Vet20 can be be used on anesthetized animals as well as awake animals. Instructional video that covers the steps to take a BP measurement on cats and dogs with the SunTech Vet20 BP Monitor. It is assumed that the correct BP cuff size and proper cuff placement have already been performed. Instructional video that describes how to access and view BP results from the Main and Memory screens on the SunTech Vet20 BP monitor. This video also goes over how to perform selectable BP averaging as well as deleting stored BP results. In this video, you will watch as Tucker gets his blood pressure taken using two different methods during a typical visit to his veterinarian. The left side of the screen will show the measurement being taken with the SunTech Vet20, an oscillometric blood pressure device. The right side of the screen shows the measurement using a Parks 811-B Ultrasonic Doppler Flow Detector. Discover how the SunTech Vet20 can be used to generate income for your vet clinic today. Simply enter the number of wellness visits, diagnosis procedures, or Hypertension Medication checks you do in a day to calculate how long before you see a return on your investment. After you have finished plugging in your data, you can save the results by hitting the "print" button which will create a pdf of your custom ROI data. "The SunTech Vet20 BP monitor has a vastly superior user interface to other monitors I've used. Readings are more accurate with fewer motion difficulties and error messages. I would highly recommend this unit." "The one finger button operation of the SunTech Vet20 allows me to pet the patient with my free hand, hopefully putting it at ease, while the monitor takes the BP measurement. 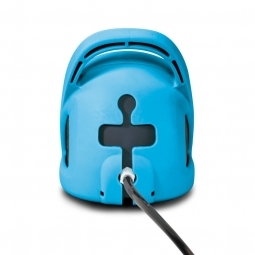 The monitor itself is so thoughtfully designed, it's very compact and lightweight, and the available outer covering not only provides protection for the monitor but the built in handle is extremely convenient for moving it around and taking it where ever the patient is located, and most comfortable." "We appreciate the ease of use that comes with the SunTech Vet20. It gives fast, reliable readings -without hassle- and this is important for our busy workflow. We don't have time for error messages - we need results we can count on." Want to be featured on this page? Submit a featured testimonial here. Discover the Difference with the SunTech Vet20 Today! Request more information about the SunTech Vet20 by using this form or purchase directly from our online marketplace by clicking "Buy Now".